to Thursday, March 21, 12.27 pm, with the ingress into LIBRA. This Full Moon is falling just a few hours after, on the same day as the Aries Equinox. This will be the beginning of Autumn in the Southern Hemisphere and Spring in the Northern. 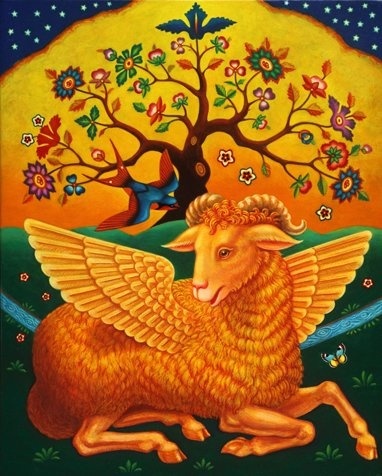 ARIES AUTUMN EQUINOX in the Southern Hemisphere (SPRING in the North) on MARCH 21, 3.15 am !!! based on the seasonal relationship between the Earth and the Sun. 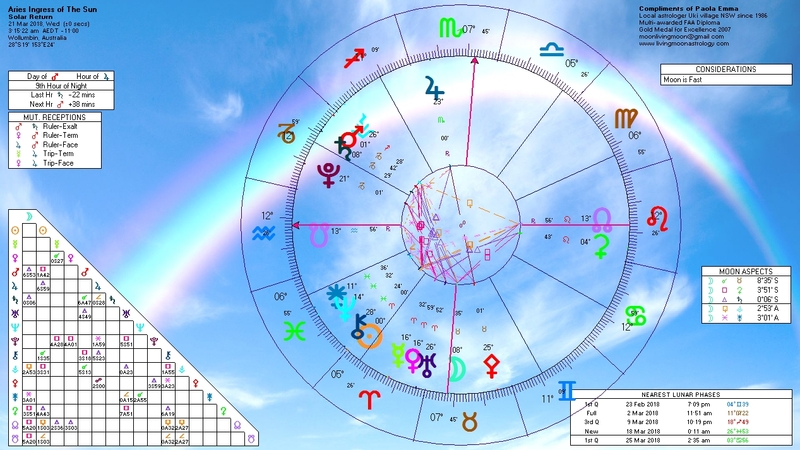 Here is a Rainbow Chart of the Aries Equinox 2012, calculated for the coordinates of Wollumbin, my place in the Northern Rivers region of NSW, Australia. The relative positions of Sun, Moon and Planets remain the same all over the world, what changes from place to place is the orientation of the same to the local horizon. If you want to convert my standard of time to yours, please visit the World Clock site HERE. $1 a minute Intuitive Readings, in person, by phone or Skype. More comprehensive, in depth Readings also available. Pay Pal or direct bank deposit. Please navigate from this link to my Consultation Page for details. 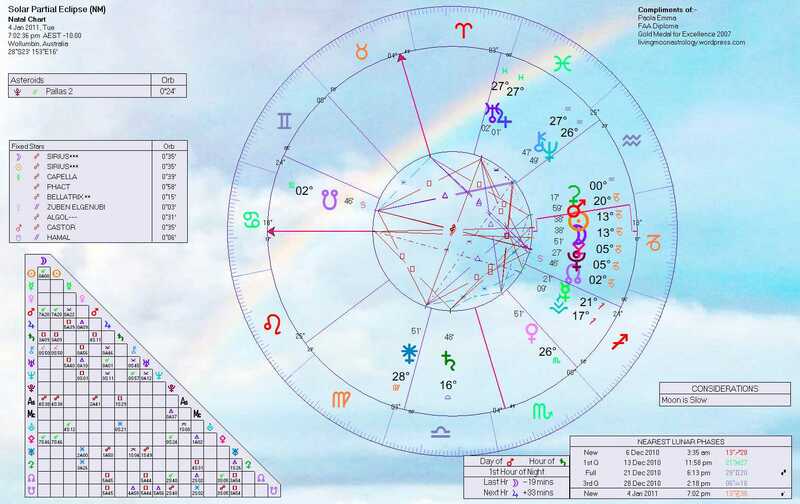 Rainbow editions of your Birth Chart, Return and Progressed Charts etc, can be ordered here, $1 per Chart. ~ And $5 Solar Fire Compatibility Readings here. Apology for again posting this weekly update late. There is so much going on at the moment and so little time (and electrical power) in my personal life I’m finding it hard to stick to my deadlines. Big cosmic events have happened at the start of the week, with the Aries Equinox and the conjunction Sun-Uranus on Monday, March 21. 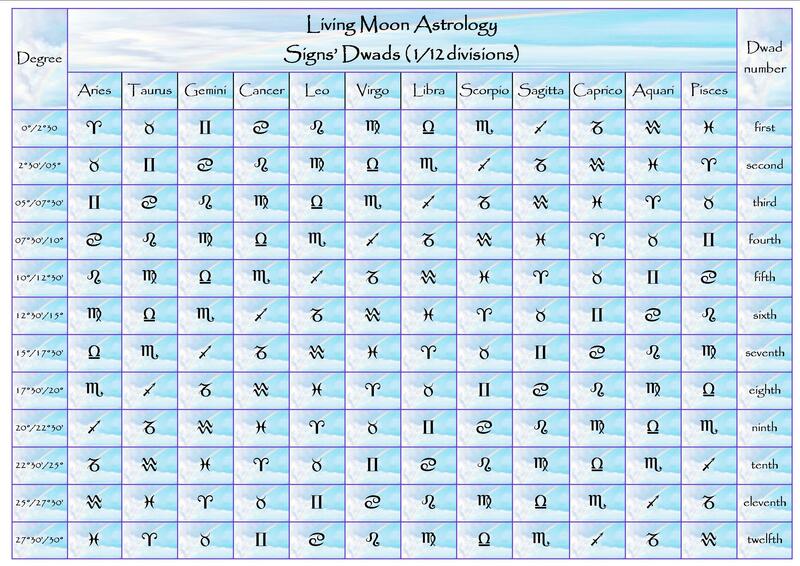 I have already discussed these events in a previous post, Full Moon in Virgo and the Aries Equinox conjunct Uranus so I’ll only make a note about them here. The most important mutual aspect this week will be the sesqui-square (135 degrees) between Saturn retrograded in Libra and Neptune on the last degree of Aquarius, on March 25. Also coming on, but not exact until March 29 is the last opposition Jupiter-Saturn, from Aries to Libra. The most recent difficulties experienced by the global economy, due to many natural and man-made disasters, bear the signature of this historical opposition, the third and last to occur since May 2010. It will be a topic for next week’s highlights. 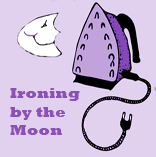 The Moon is Waning this week, from the late Virgo Full Moon on Sunday, March 20, to the Capricorn Last Quarter Phase, on Saturday, March 26, always a time for self-reflection, when we can begin preparing for the next New Moon in a week time. To end the week on a positive note, Venus will enter the Water Sign of Pisces, a suitable ambiance for our Love Goddess, on Sunday March 27. 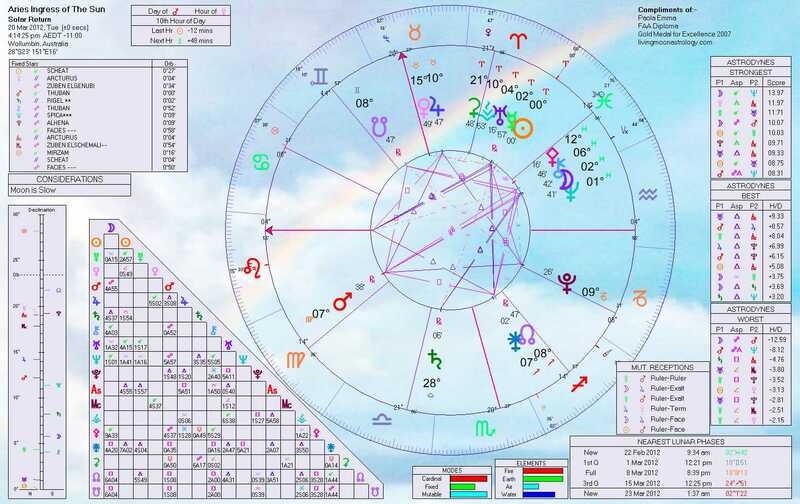 March 21: Astrologers all over the globe are seeking answers in the transits active at the time of the Aries Equinox, the Birth Chart of the new astrological year, to glean a sense of what this new year might bring. This time, we all agree, the wind of change is blowing, altering the lives of millions in a clean sweep. We all expected dramatic events of some sort, due to the number of significant shifts at hand, but reality has surpassed all expectations. Putting aside the recent cataclysmic events and gloom and doom predictions, this Sun-Uranus’ conjunction, at this pivotal time of the year and so close to a Full Moon, will present opportunities for a lot of people to take their lives into their own hands, to become more independent and self-reliant, to accept their differences and find the courage to live by their principles, rather than those the ‘system’ has prepared for them. Psychological freedom from excessive conditioning is what a powerful Uranus’s transit is supposed to foster, even when your external situation may take a longer time than your inner self to shift. As we have seen in collective uprisings in many parts of the world, people are now impatient for change, ready to fight and even risk their lives in order to make a difference, and to outgrow the past. If Uranus can make revolutionary heroes out of average citizens of an average world, so too he could revolutionize your life. You need to answer his call however. Change will not happen of its own accord, in most cases, and it would be preferable anyway to be at the helm rather than passively suffer upheavals imposed upon by outside circumstances. The Sun Sign people in direct contact with Uranus, at the moment, are Aries (March 20 to 22), Cancer (June 21 to 23), Libra (September 23 to 25), Capricorn (December 21 to 23), and also Leo (July 22 to 24) and Sagittarius (November 21 to 23), or anyone with the Moon, one of the four angles (Ascendant, Descendant, Mid-Heaven and Lower Heaven) or a planet in the first degree of the same Signs. Due to the slowness of Uranus (it will remain in Aries for nearly seven more years) this transit will extend its influence for many months. MARCH 25, FRIDAY: the sesqui-square (a tongue twister of an aspect) between Saturn retrograde in Libra and Neptune, on the last degree of Aquarius, may be considered a minor aspect by some, but in this case it is not. The two planets are in fact slow moving enough to savor this relationships, not perhaps for as long a time as with a square, opposition or trine, but long enough to leave a definite mark. In this case, for instance, the transit started becoming active in mid March and will remain active until early April (using a one degree orb). Furthermore this is already the second pass (occurrence) of this transit, because the two planets formed the same angle at the end of October 2010, when Saturn was still traveling in direct motion (first pass), and will be forming it again in late August 2011 (third and last pass).Covering such a long period of time it has certainly an impact on the collective psyche and events. While this angle is said to cause some discordance and delays that require patience, the two planets involved are known to have some natural difficulties in working together anyway, due to their very different natures: Saturn all down to earth and Neptune all spaced- out. This week in particular it could prove difficult to reconcile the need to be practical and grounded with the need to transcend limitations and allow creative and spiritual experiences to take place. When planets are in aspects the idea is to make them work together, rather than give one or the other the upper hand. In this case, the ideal would be to keep the vision alive (Neptune) without losing our sense of reality or forgetting our duties (Saturn). Individuals more likely to feel the difficulties of this transit are Libra (October 6 to 8 ), and Aquarius (February 3 to 5). MARCH 26 and 27, SATURDAY and SUNDAY: these two days are dominated by the Sign’s change of Venus, from logical Aquarius to romantic (and not so logical) Pisces. A post on this shift is in the pipeline. A few words here: in traditional Astrology Neptune is said to represent the higher octave of Venus (a musical term meaning the reproduction of a sound at a higher, or lower pitch), because if we identify Venus with love, we then have to identify Neptune with compassion, the highest expression of love, when we love not for what we can get out of the other person (attention, pleasure, support etc. ), but unconditionally. Venus transiting Pisces, the realm of Neptune, is said to take on the spiritual garb of the Oceanic God, to allow us to experience the unconditional love toward our fellow human beings and the sense of unity that that love brings. This is also a very imaginative and artistic Venus, helping us to appreciate beauty in all its forms, from natural to cultural beauty, sensuality and poetry. Negatively we run the risk, while Venus is in Pisces, of glamorizing the idea of love and idealizing the people we love to excess, looking for the ever elusive soul-mate of our dreams. Keeping the heart anchored on something solid (a sense of self), and keeping some emotional boundaries up will help to avoid these pitfalls. Individuals more likely to feel the enchantment of Venus in Pisces, over the next month, will be Pisces, of course, as well as Cancer, Scorpio, and, mixed with difficulties, also Virgo, Gemini and Sagittarius. Venus will be transiting Pisces until April 21. Click here to navigate to my most recent post on the transit of Uranus in Aries, and other major transits. For more information about the imminent ingress of Neptune in Pisces, please check two of my posts on the subject HERE and HERE. A post on Jupiter transiting Aries can be found HERE. Welcome to the sky narrative to begin 2011, from the Capricorn Solstice in December 2010 to the Aries Equinox in March 2011. 2010 and 2011, two more years ending and beginning with eclipses. These are the magical moments in the Earth-Moon-Sun cycle, when the three celestial bodies align, creating a powerful nexus of energies, from the solar center of consciousness through the lunar world of psyche to the earthy world of physical experience. These events so close to the Capricorn Solstice point to another intense and eventful period ahead for the world. The Total Lunar Eclipse is first, on December 21, just a few hours before the Solstice, Moon on the last degree of Gemini and Sun on the last degree of Sagittarius. This will be a special Full Moon for people with Sun, Moon, Ascendant and/or Planets on the cusp Gemini-Cancer, Sagittarius-Capricorn, Virgo-Libra, Pisces-Aries. A signature eclipse for those same people who are also experiencing the power of Pluto, Uranus and Jupiter, agents of transformation, excitement and opportunity, and have recently struggled with the need to ground themselves and become more seriously committed to their relationships, their families, their jobs and goals (Saturn in Libra). A difficult balancing act, making us more aware as a collective (not just the people directly aligned to these transits) of the humongous inner tension between autonomy and obligations, the safety of the known and the exhilaration of the unknown, cosmic themes of the past few years. Contemporary with the eclipse is the Capricorn conjunction of Mars-Pluto, and the forming right angle Mars-Saturn. The first can be an extremely extreme kind of transit, when the youthful and often blind vigor of Mars is attempting to work together with the old god of the underworld, a cunning and powerful bedfellow. Things that we have relegated to the underworld of our unconscious psyche, individually and collectively, will be forced by the sheer muscle of Mars to erupt to the surface, with, naturally, consequences: some radical change of landscapes, literally and symbolically; blowing up of unprocessed inner contents finding their way to consciousness, revealing what we wanted hidden for good reasons in the first place. The contact Mars-Saturn will tend to make the mix Mars-Pluto more tangible, manifesting in actual difficult events. At the time of the Lunar eclipse retro Mercury is also forming an aspect to Jupiter-Uranus, exciting stuff, because here we have a trio whose members all have something to do with the process of thinking. Mercury is the ABC planet, helping us to sort the world’s inventory, giving a name to everything, like good old Adam or Hermes. Because Mercury is moving backward at this time, contrary to the ‘natural’ order of things, its role could go beyond the indiscriminate gathering of information. Jupiter’s role is, on the other hand, to give meaning to the words we have learnt to spell with the help of Mercury, stimulating us to speculate on infinite possibilities. 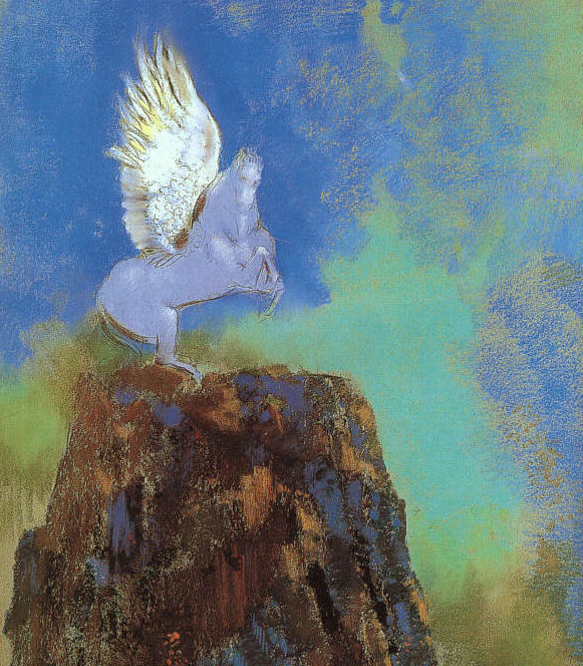 Finally Uranus, mythical sky god, is helping us to contact the abstract, the conceptual, to arrive at unanticipated breakthroughs via the medium of our own individual genius. A full-on time, it seems. We should not expect anything less from a Full Moon eclipsed on the Cusp of Magic, Gemini-Cancer, where reason and feeling embrace. The Partial Solar Eclipse, on January 4 2011, is a New Moon in Capricorn. The eclipse coincides, to the day, with the third and last pass of the Jupiter-Uranus’ conjunction. Much has been written about this conjunction, promising the types of upheavals our world needs at present, a change of direction, and the willingness to embrace new circumstances and ideals with optimism and confidence. Jupiter is in fact expanding the scope of Uranus, offering novel paradigms to accommodate the changes that it is Uranus’ role to uphold. The eclipse will carry the effect of this conjunction into the future, long after the aspect has lost its momentum. Another highlight of this eclipse is the conjunction of Sun-Moon to Pluto in Capricorn, with Pluto heliacal, rising before the Sun. Plutonian intensity can be detected in this configuration too, but the conjunction is weak due to a wide orb. Of considerable importance is the right angle between Sun-Moon and Saturn. During the first three months of 2011 Saturn will transit over the Birth Sun of those Libra born between October 6 and 12. They are the ones who will now need to give serious consideration to their practical concerns, money, job, family, long term plans, according to the eclipse’s indicators. The whole alignment in Capricorn (North Node-Pluto-Pallas-Sun-Moon-Mars) shows that collectively also the goal of this New Moon is to stimulate our practical leanings. The Saturn’s aspect represents those obstacles and setbacks that will accompany our efforts, the struggle necessary to make our plans reach full maturity. 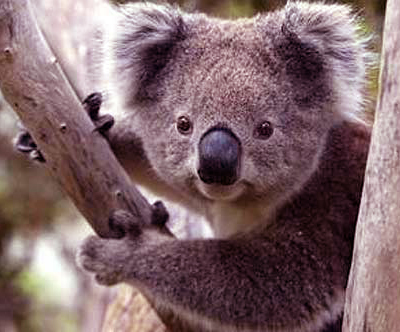 Pressing material problems are vying for our attention, procrastination not the wisest choice this ecliptic season. Since the end of October 2010Venus has been our Morning Star heralding the Sun in the pre-dawn sky (Lucifer=light-bringer). The Morning Star incarnation of our sister planet presides over the external activities we engage in every day, an unconcealed Goddess of Love walking in our midst, actively seeking relationships but not too discriminating about them. The Evening Star’s role of Venus was instead to illumine the sky after sunset, a picture of withdrawal from daily activities and entrance into the realm of the unconscious, night, dreams, introspection, memories, clues to the inner side of relationships. So we are now in a waxing phase of Venus, when relationships will beacon from many quarters, when we will be more prepared to risk disappointment by following our immediate desires. All together this is a happier, less complicated phase of Venus’ cycle, when we can enjoy our relationships with naivety, beginning new ones with a sense of hope and expectation. It is part of the cycle of life. Without this phase we would be too withdrawn and ‘see’ too much in advance to feel inclined to start new relationships, to dare to believe in love. This Lucifer phase will last until October 2011. Jupiter will enter Aries for good on January 23 and transit this Fire Sign until early June. This is a chance for everyone who has an Aries oriented Chart to seek more from life, to seize those opportunities that will come along readily at this time. It would be a great period for traveling or furthering one’s education for all the Fire and Air Signs too. May the Force be with you. Libra, Capricorn and Cancer however would do well to temper their enthusiasm, because Jupiter in difficult angle with their Sign could inflate their expectations in some areas and the actual results may disappoint (which area depending on the position of transiting Jupiter in your Birth Chart). Uranus is also entering Aries on March 12, but its transit will end only in 2018. For all Aries oriented people this will be a significant shift. Forces often beyond your conscious control will push you to take new directions, emotionally, ideologically, professionally. Picture this: Uranus stimulates changes to occur, being contrary by nature to stagnation and the status quo. Aries is the Sign of new beginnings and the impulse for what has not been tried before, the courage to make a leap in the dark, illumined only by one’s hopeful desires. It is time to pioneer new ideas, to dare to be different, to risk in order to gain. Negatively Uranus in this self-centred Sign could spell disaster for the diplomacy and cooperation promised by the transit of Saturn through Libra, making Aries even more war-like and confrontational. Historically Uranus was in Aries the last time between 1927 and 1934, an epoch that saw the rapid growth of armament in the world, in preparation for the Second Great War, an age of political turmoil and unrest, fuelled by the global depression and the socio-political aftermath of the previous Great War. That age witnessed the growth of right wing movements all over the globe, from Latin America to Germany. On the other hand this was also the New Deal period in the States and an extremely prolific period in literature and the arts, one that truly modernized our concept of culture. The whole period was the start of something quite different at many levels. Saturn is turning Stationary Retrograde on January 26, moving backward until June 13. This retrograde period will see us having to re-consider the way we perform our practical tasks, the personal responsibility we invest in our activities. What is manifesting in the present we have laid the foundation for in the past: strong, solid foundations or weak, inadequate ones. If you have done your home work this will be a positive period for solidifying your position and make things water-tight for the future. If you have procrastinated or fearfully retreated from what was asked of you by Saturn now it is time to pay him back via extra labor, perhaps some ill health, doubts, fears, insecurities; ‘what I’m doing with my life’ feelings, etc. Not to despair, this too will pass. This retro period will affect more closely those people whose birth Sun, Moon, Angles or Planets lay between 10 and 17 degrees of Libra, Aries, Cancer, Capricorn. Neptune is entering Pisces for the first time in 163 years, on April 4. It will return to Aquarius between August 2011 and February 2012. After these tentative passes into Pisces, Neptune will traverse this Water Sign for 14 long years, until 2025. This transit has been very much anticipated by astrologers, because Pisces is the oceanic realm of the sea God himself. Planets are traditionally stronger when placed in the Signs they rule and so the power of Neptune will be on the increase in our near future. Neptune represents the oneness of all human beings and nature, the underlying spirit that permeates all. 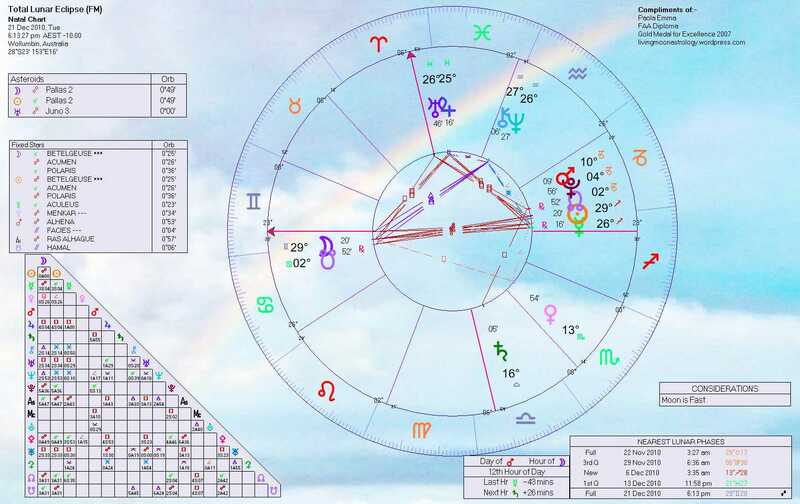 The last time Neptune transited Pisces was between 1848 (soon after its discovery in 1846) and 1862, the time the Romantic Movement was born in Europe and socialistic ideals became formalized in the writing of Marx and Frederick Engels (the Communist Manifesto was published in 1848). This was also a period of Occult Revival, reaction to the rationalistic stance of the so called age of Reason brought about by Europe’s industrialization. Chiron will enter Pisces for good on February 9 and remain in this Sign until 2018/19. The Chiron-Neptune’s conjunction, periodically active from early 2010 to the end of 2014, will be close around eclipses’ time, in December-January. This aspect has permeated our inner skies with an immense longing for healthier human values (Aquarius) and the wish to heal the separateness which is the source of all our ills. This aspect shows the collective desire for unity to be on the increase, despite the worsening outer struggles of our troubled world. May the New Year Planets be our guiding friends.